Guaranteed seat location for all regular season home games and priority seating for playoff games. Best price for all home games. Exclusive year-round membership events including mid-season event with all players and coaches and invitation to member-only preseason practice and ticket pick-up event. Annual Skyrider gift and enrollment in Skyrider rewards program, with chance to win prizes such as a private lunch with players and Sky General Manager and Head Coach James Wade. Discounted Sky merchandise and ability to purchase additional tickets at discounted rate. Ability to redeem unused tickets for any 2019 regular season home games. First to receive Sky announcements with season ticket member newsletter. Flexible Payment Terms – Skyriders have the options to pay for their memberships in full, quarterly, or monthly installments. Premium Skyriders – Skyrider members will have access to all-inclusive food and beverage (beer, wine, and soda) to all home games in the Wintrust VIP Lounge or the all new Magellan Courtside Club. 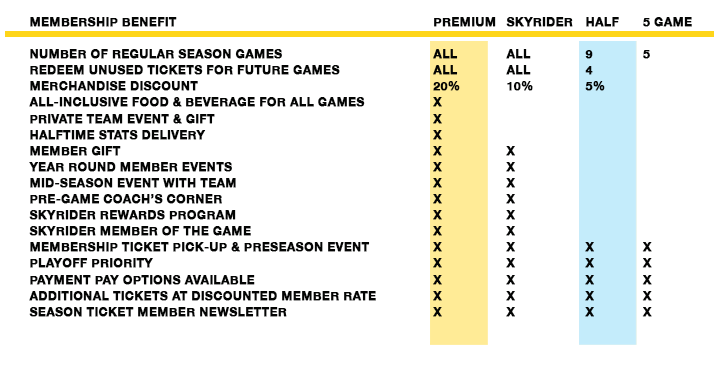 Premium Skyriders also receive an additional in-season premium member event and gift. Invitation to member-only team preseason practice and ticket pick-up event. Discounted merchandise through Sky online store and ability to purchase additional tickets at discounted rate. Guaranteed seat location for regular season home games and priority seating for playoff games. Dedicated Chicago Sky team representative. Membership ticket pick-up and invitation to open practice event. Payment plan options available: Pay in full or one-and-one (50/50). Flexibility to redeem unused tickets for select 2019 regular season home games. Discount off individually priced tickets. Guaranteed seat location for regular season home games. Option to pay for membership in full or through a 50/50 payment plan. (866) SKY-WNBA, or by filling out the form below and a Sky representative will follow up with you directly.